In most health systems there are programs to track whether highly effective interventions are being used appropriately. When they aren’t being properly used, efforts are made to improve their use. The eleven medications we identified should be part of these programs. 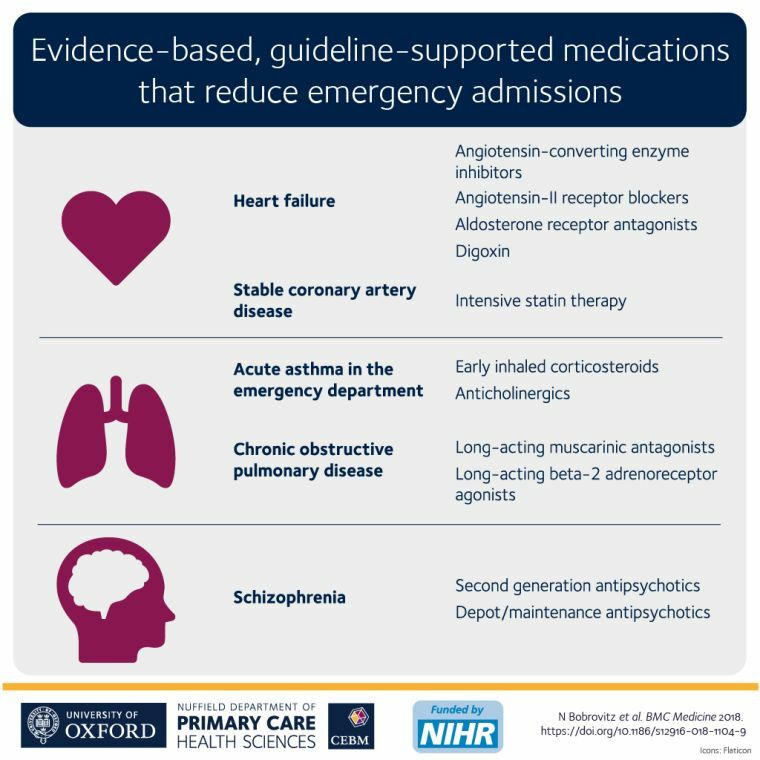 The most effective medicines for preventing emergency hospital admissions have been identified by a team of researchers in Oxford University's Nuffield Department of Primary Care Health Sciences. Reporting in BMC Medicine, the authors suggest these treatments could be considered for inclusion in quality monitoring and improvement strategies. The researchers reviewed data from nearly 2,000 drug trials and 1 million patients. They identified eleven commonly used medications that significantly reduce emergency admission rates in patients with major chronic diseases, such as heart failure, asthma, and chronic obstructive pulmonary disease. The study's lead author, DPhil Student Nik Bobrovitz, says this is a key step towards reducing emergency care pressures. “We need to reduce demand on emergency services, which are currently stretched to their limit. Past initiatives have failed. We decided to examine the issue from a unique and simple perspective. The UK-based researchers suggest their study has implications for health systems all over the world. The researchers hope their work will help to ease the burden on emergency services. This research was funded by the National Institute for Health Research School for Primary Care Research. The views expressed are those of the authors and not necessarily those of the NIHR, the NHS or the Department for Health and Social Care. The Oxford Science Blog: Which medications prevent emergency hospital admissions? Medications that reduce emergency hospital admissions: an overview of systematic reviews and prioritisation treatments. Niklas Bobrotiz, Carl Heneghan, Igho Onakpoya, Benjamin Fletcher, Dylan Collins, Alice Tompson, Joseph Lee, David Nunan, Rebecca Fisher, Brittney Scott, Jack O'Sullivan, Oliver Van Hecke, Brian D Nicholson, Sarah Stevens, Nia Roberts and Kamal R Mahtani.